A Supermoon, Blue moon, and a lunar eclipse are expected to occur on 31 January. Alongside a Blood moon is also expected to appear. On 31 January 2018, a rare lunar trilogy will occur. A Supermoon, Blue moon and a lunar eclipse will occur simultaneously. This lunar event is significant since it is happening after 150 years. Such a celestial event last took place in 1866. According to a previous report, the moon rotates in an elliptical orbit around the Earth. When it comes partially in the shadow of the Earth, it is known as the penumbral phase. Soon when it comes completely in the shadow of the Earth it is known as the umbral phase. Lastly, when the sun, moon, and the earth come in a straight line, it is known as full moon. 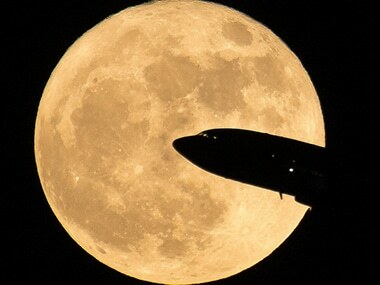 Now, when two full moons happen in a gap of 29.5 days, that is, in one month, it is known as Blue Moon. In 2018, one full moon had occurred on 1 January and the next is slotted to be on 31 January. Hence, on 31 January, along with the lunar eclipse, Supermoon, a Blue moon will also occur. Since the lunar event is expected to happen during the evening, the moon will not go into complete darkness, rather the light will be scattered and may appear reddish. Hence the name Blood Moon, for the way the moon will look on 31 January.